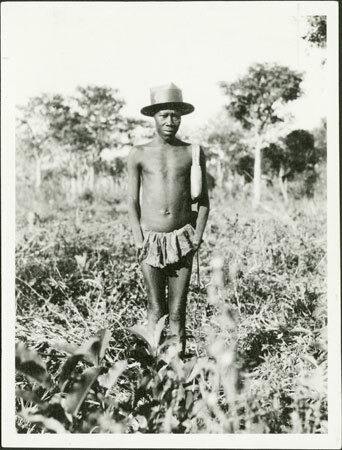 A full length portrait of a man (identified as Bitarangba) wearing a straw hat and carrying traveller's shoulder bag. He has been mutilated in the past, both hands having been removed (there is a possibility that his ears have been mutilated also). Such acts were carried out in pre-colonial times, often on suspicion of adultery. Notes on print/mount - "[publisher's measurements]"
Morton, Chris. "Portrait of a Zande man" Southern Sudan Project (in development). 03 Jan. 2006. Pitt Rivers Museum. <http://southernsudan.prm.ox.ac.uk/details/1998.341.292.2/>.